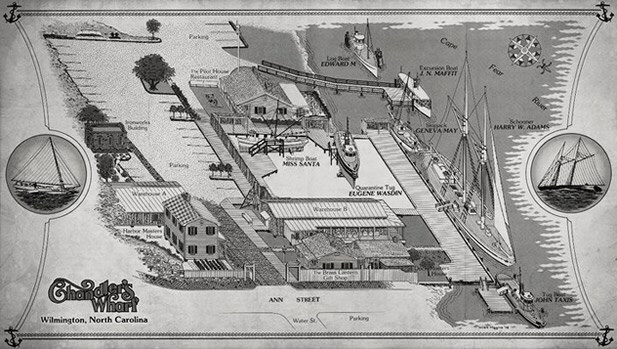 The Property that is now Chandler’s Wharf, (which is home to Elijah’s and The Pilot House Restaurants), was originally owned by Colonel F.W. Kerchner. Kerchner was born in Germany in 1829 and later moved to Baltimore, Maryland. Col. Kerchner was in command of the company that affected the capture of John Brown and his group following the raid on the Harper 2019s Ferry Armory. Coincidentally, Kerchner’s immediate superior during this historic confrontation was Lt. Col., (soon to beGeneral), Robert E. Lee. After the Civil War, Kerchner made his way to Wilmington and made his residence at the Governor Dudley Mansion, located at the corner of Front and Nun Streets. The warehouses and docks that he and his business partners operated here for the remainder of the 19th century dealt with a variety of goods, but the bulk of the products were tar, pitch, and turpentine. These products were extremely important in the operation of the wooden ships used during that time. Unfortunately, turpentine was also extremely flammable which likely led to a serious fire that occurred here in September of 1874, and caused over $120,000 in damage. Following the death of Col. Kerchner in 1910, the property went through numerous owners until it was purchased by Mr. and Mrs. Thomas Wright Jr. in 1977. The first restaurant on the property was the Pilot House which opened in 1978. In 1984 Elijah’s Restaurant, which had previously been a maritime museum, opened its doors. Many of the rare paintings, ship models, and nautical artifacts remain on display in the restaurant. In 1988 Elijah’s had grown so busy that they needed to expand which resulted in the building of the Oyster Bar and its outdoor deck, and several years later we opened up our dock seating. We look forward to serving you, not only with good food and service, but also a piece of history.